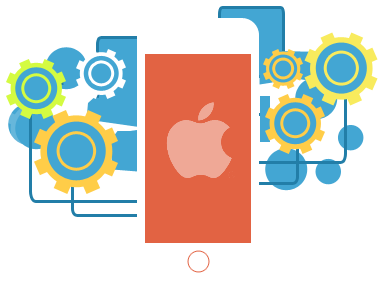 PristineSoftsis a full-benefit iOS application development organization giving services that cover the whole development cycle, from idea to delivery. Utilizing a demonstrated Agile system and in-house ability, we cover end-to-end custom application that incorporate the total scope of iOS gadgets, including iPad, Apple TV, watchOS and iPhone application advancement. Our way to deal with iOS application development has brought about highly secured, user-friendly successfull applications that brought perfect ROI to our clients. We have highly experienced dedicated team of iPAD, iPhone developers who are certified and delivered number of successful projects for our clients. We perform entire development process from conceptualization to delivery In-House. Our team is highly efficient and We never outsource any part of development to any third parties. All iOS advancement is finished by means of a custom Agile process that limits risks, amplify the speed, and advances stage wise transparency. We cater you end-to-end iOS development solutions including product strategy, UI/UX design, development, testing, and delivery. We handle the whole App Store accommodation process including listing, portrayals, resources and more. We provide appealing maintenance and support tariff’s over our iOS development services that assist you keep over stage refreshes and application updates. Xcode is the perfect development environment for iOS, macOS, watchOS and tvOS Application development. It supports source codes of both Swift and Objective C programming languages. PristineSofts offer full-fledged iOS application development services. The team takes care of the whole advancement cycle from idea to advertise conveyance. We have acquired an abundance of experience in iOS application advancement to your needs. iPad and iPhone application advancement are among our center abilities, enabling us to convey solid native iOS applications that offer consistent client encounters. Swift is a broadly useful, multi-worldview, accumulated programming language for iOS, macOS, watchOS, tvOS, and Linux. Our developers are well versed in coding with Swift to deliver highly proficient applications for iOS, macOS, watchOS and tvOS. Though Swift took over Objective C over the years, Our team is good in coding with both Swift and Objective C to convey very capable applications for iOS, macOS, watchOS and tvOS.